Hungary is really at the precise geographic center of Europe, with Russia and Ukraine to the east, and Austria and the rest to the west. The Hungarian Houses of Parliament, the largest in Europe. Beautiful, and reminiscent of those in London. 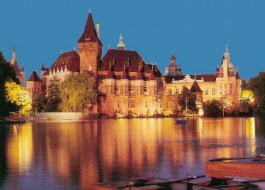 The beautiful turn-of-the-century Vajdahunyadi Castle, built for the World Expo, now the Hungarian Museum of Technology. Entitled after a village in Hungary. Conditions are not always all that they could be, especially among the Gypsy, or Roma, minority. Photo: M. Judit Horváth. One of the many street musicians in Hungary. Photo: Dávid Lukács. Get an inside look at a foreign country. With regular updates. One upset traveler's negative experience in Budapest. Spicy Hungarian Ewe Cheese Spread. Goes great on toast or crackers. Serve it up at your next beer drinking session. "Ouch, I’ve been bitten by a rug!" I once cried, not to the small amusement of my Hungarian friends, even though all that had happened was that despite my best efforts I had inserted the wrong vowels into the consonant string sznyg (as szúnyog means mosquito, and szőnyeg, rug). Hungarians don’t usually understand how it is possible to confuse such widely diverging things, when indeed the anglophone ear and eye is more likely to pinpoint the consonants, and just sort of slide over the vowels. And then there’s an agreement that must exist among Hungarian vowels which drives students of Hungarian nuts (quick—which matches ű? E? A? Ő? Or maybe ű itself?). By the way, it’s crazy. 'Crazy' is a word that can lead to new problems in Hungarian; anyone who can tell the difference among őrölt—‘ground up’, őrült—‘crazy’, and örült—‘he was happy,’ is either Hungarian, or a bat. So it doesn’t hurt to practice. [...] In a word, the matter of pronunciation is a tough one. In fact, for the English and Americans it is in practice impossible, given that English words don’t resemble each other so much, precise articulation plays a much smaller role. Which can cause a big problem in your head, if you’re not careful. Especially we must of course be careful when we ask for forgiveness of an accidental insult. The words for ‘insult’—sértés, and ‘pork’—sertés, a very similar indeed, which can lead to new problems. When Dezső Kosztolányi, the Hungarian poet, compiled a list of the ten most beautiful Hungarian words, he could have had the foresight to choose only from those words that can be pronounced by non-Hungarians. You can be sure, the average foreigner with experience of diphthongs would be able to tumble into ruins the writer’s opinion of gyöngy—‘pearl’, szűz—‘virgin’ and ősz—‘autumn.’ The matter is of course the same way when viewed in reverse. For Hungarians, English pronunciation is not exactly a cakewalk, and today’s Hungarian is full of loan-words from English like menedzser—‘manager’ or dzsessz—‘jazz.’ But Hungarians like words. In fact, they adore talking. That’s why, if a foreigner cannot come to grips with the Hungarian language, there’s no need to worry. You can at least provide a good audience. To the above I could add my own experiences. It's no picnic at all learning the Hungarian language. Even with all the years that I have lived here, I have trouble when shopping for Hungarina pasta squares—kocka tészta—and often ask for kockás tészta—checkered pasta—instead. Feeling in a particularly clever mood, I tried to announce in Hungarian that I would dash off—robogok—to the store. But the verb I used was ropogok, with a p. So I had informed my listeners that I would be propelling myself to the store on a jet of flatulent gas. On a pleasant excursion with two girlfriends in the hills, I had just reached conversation level in Hungarian, and I was feeling pretty proud of myself. Spring had just turned warm for the first time that year, and I, in my heavy jacket, was hot. It was no problem to translate this literally into Hungarian: meleg vagyok. Unfortunately, I had no idea of Hungarian slang, so my girlfriends were all giggles to hear me declaring,"Meleg vagyok. Nagyon meleg vagyok! Hú, de meleg vagyok! "—or "I'm gay. I'm very gay! Oh, boy, am I ever gay!" Remember, the Hungarian word for hot—meleg—also means "gay". "I'm hot" is melegem van. Consider another situation that came up after a Hungarian friend had installed our cabinets for us. I was trying to convince him to accept a modest payment. What I was trying to say was kapd el—"take it". Unfortunately, what I said was kapd be—"blow me". Factual background about the Hungarian language. Hungarian words in the English Language. Use this handy currency conversion counter to plan your trip. Convert dollars, pounds or euro to Hungarian forints, as well as converting between many other currencies. Hungary's freshest English-language web portal. Rent the best flats in Budapest for 10 euro a night. Some people find my page while searching for "translate English into Hungarian," or while searching for specific Hungarian words. These folks should go to http://dict.sztaki.hu/english-hungarian for a good online English-Hungarian dictionary, or, if that doesn't work, to www.sztaki.hu, and click on "services". There is a translation program available, probably for a fee, which I haven't tied. It purports to translate whole pages of Hungarian text! Try Origo.hu, a good Hungarian search engine, for good, specific information about Hungary. Mostly in Hungarian. Cyber City Guide--Budapest hotels: Guide to Budapest including discount hotels, attractions, general info and more. Geatest Cities.com has a page on Hungary and on Budapest. Many other cities are also listed. www.welcome-2-europe.com - Regional Information and more. Includes Hugary.